Home Enlivening Two Equations Of Who We Are! Our Soul is like a backpacker on holiday, carrying everything he needs is his trusty sack that sits comfortably on his back, it never leaves his side, it becomes a vital possession once he enters the forest. Our Soul tags along with us where ever we go, a trusting friend indeed once we become independent in the world. Our Ego is constantly with you as well, always in the shadows but never far away. Often times we are reluctant to invite our mind to spend time with us, the trouble is the Ego waits for no invitation, it thinks nothing of being an unwanted guest to any occasion, so most often the choice is not ours to make. Recognizing there are two equations to who we are, it then becomes a process of equating one part from the other, situations and circumstances are opportunities for us to question the identification of whether it is our Soul or our Ego that wants to offer up assistance or advice. Several factors must be taken into account, the Ego loves to create drama, what exactly is the drama you ask? Drama is anything that appears theatrical or show business-y, like performances in a soap opera, everything is dramatic, overemotional and exaggerated. 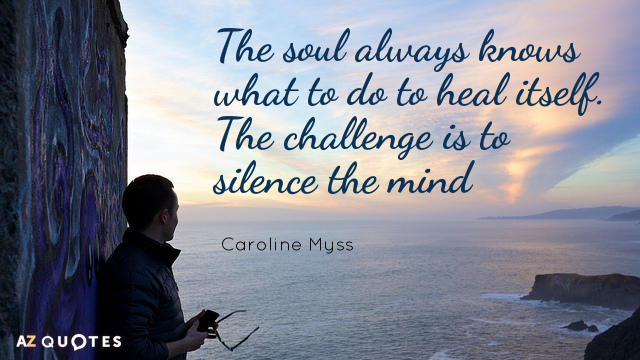 The Soul, however, is a feeling of all knowing, what does that actually feel like I can hear you saying! Conscious awareness is intended to feel peaceful, calm, quiet and wilful, no drama, no panic, no need to take long deep breaths, it is a feeling that brings a clear and absolute message, ‘everything is going to be ok’, kind of attitude. It’s comforting at least to know that wherever we are and whomever we are with our Soul is right there with us just in case we might need some support or encouragement. In simply understanding our Ego is along for the ride as well, whether we like it or not, it allows us to form an alliance or a treaty if you will so we might work together with the two equations of who we are. Understanding which is which, is it our Soul or our Ego that is trying to do the talking takes practice, patience, and courage. Soul work is labour that grants incredible results, so please don’t give up, keep working hard, the Universe recognizes you.